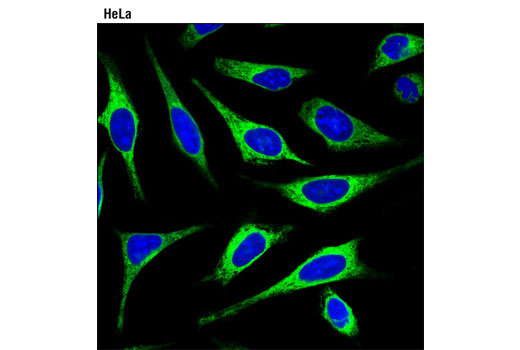 Confocal immunofluorescent analysis of live HeLa cells using ER-Tracker™ Green (BODIPY® FL Glibenclamide) (green). Blue pseudocolor = DRAQ5® #4084 (fluorescent DNA dye). ER-Tracker™ Green (BODIPY® FL Glibenclamide) is supplied as a single 100 μg lyophilized vial. To make a 1 mM stock solution, reconstitute the solid in 128 μl of high quality DMSO. Dilute 1:500 directly into normal growth media for a working concentration of 2 μM and analyze immediately. Cells must be imaged live; DO NOT FIX! To reduce background fluorescence of the media, phenol red free media can be substituted for normal media prior to imaging. BackDrop® Green Background Suppressor #12388 can also be added to reduce background fluorescence. Store lyophilized solid or solution at –20°C dessicated and protected from light. Once reconstituted in DMSO, the solution should be aliquoted to avoid freeze-thaw cycles. If stored properly, this reagent is stable for 6 months. ER-Tracker™ Green (BODIPY® FL Glibenclamide) is a cell-permeant, live cell stain that is highly selective for the endoplasmic reticulum (ER). This stain consists of the green-fluorescent BODIPY® FL dye and glibenclamide. Glibenclamide (glyburide) binds to sulphonylurea receptors, the regulatory subunit of ATP-sensitive K+ channels prominently expressed in the ER. The pharmacological activity of glibenclamide could potentially affect ER function. Variable expression of sulphonylurea receptors in some specialized cell types may result in non-ER labeling. BackDrop® is a registered trademark of Molecular Probes, Inc.